Hi friends, thanks for joining us as our little family celebrates the first day of Advent. We lit our first advent candle and sat down at the table to enjoy some coloring, reading and prayer. 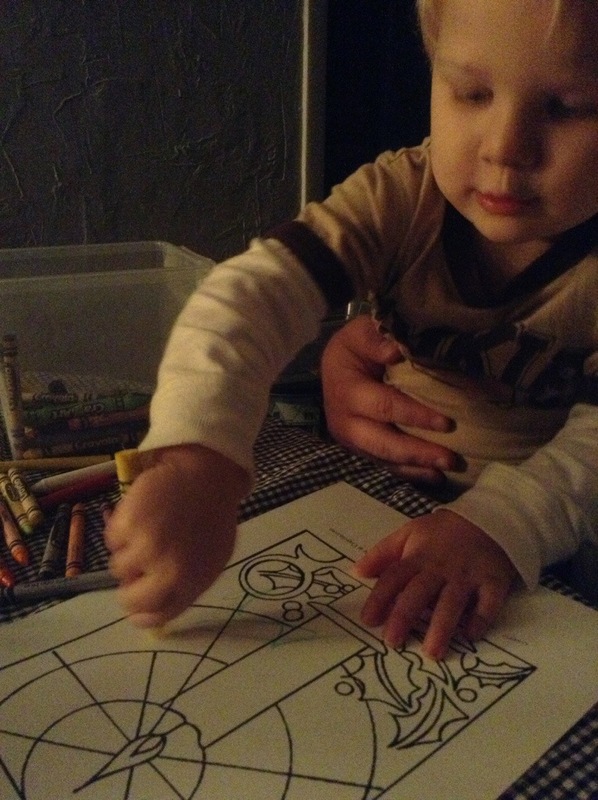 While Bear filled in a free coloring page that I printed from crayola.com (you can find it here), Josh and I explained to him what Advent is all about. The word Advent means “coming” or “arrival”. The focus of the entire season is the celebration of the birth of Jesus the Christ and the anticipation of the return of Christ the King. Advent is celebrating a truth about God, the Revelation of god in Christ whereby all of Creation might be reconciled to God. Expectation, anticipation, preparation, longing. There is a yearning for deliverance from the evils of the world first expressed by Israelite slaves in Egypt as they cried out from their bitter oppression. We wait in anticipation of a King who will rule with truth, justice and righteousness over His people and in His Creation. It is that hope that once anticipated and now anticipates anew the reign of an Anointed One, a Messiah who will bring peace, justice and righteousness to the world. Josh and I talked about recognizing our need for a savior in a world where brokenness begets brokenness, sometimes for generations. In this world where loss and pain are a part of life we are thankful that Christ has come to bring us hope and it is with that hope that we face the future. What did you discuss/read/pray about tonight? I would love to hear about your journey through Advent this year.